The IASSC® Marks Usage Policy has been established to provide clear and definitive policies for the acceptable manner in which the IASSC Marks may be used. IASSC encourages those who have earned an IASSC Accreditation and/or Certification and/or Authorized Exam Administrator, Distributor (“Designation”) to utilize these Marks in personal titles, business titles, communications and marketing material. The proper and permissible use of these Marks is established herein. For the protection of all those who have legitimately earned a Designation, IASSC seeks to rigorously defend against improper use. These marks are known as the “IASSC™ Marks”. Associated with each “Accreditation & Certification” Mark are a Large Badge, Small Badge, Seal and Certificate as shown in Schedule A – Badges, Seals and Certificates. 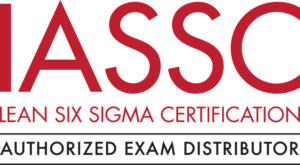 Associated with each “Exam Administration Program” Mark is a single Badge as shown in Schedule A – Badges, Seals and Certificates. 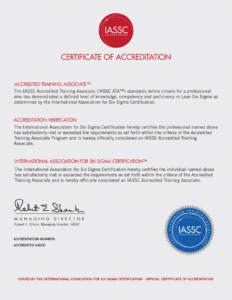 This IASSC™ Marks Usage Policy (“Policy”) has been developed to assist you in featuring the marks in print, multimedia and online communications including business cards, letterhead, advertising, presentation materials, personal promotional literature, signage and websites. The IASSC™ Marks may be used only as described in this Policy. 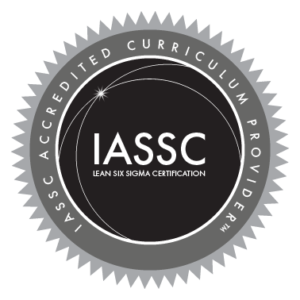 When properly used they represent standards of excellence as established by IASSC™ and as earned by accredited/certified and authorized parties in compliance with the IASSC™ Accreditation Program Description and the IASSC™ Certification Program Description and the Exam Administration Program Description. 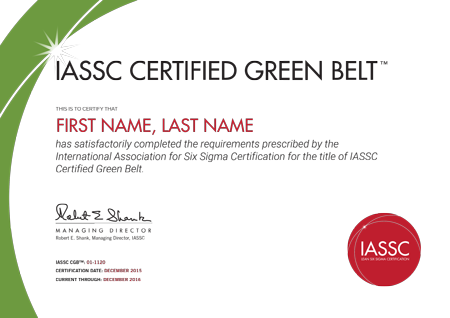 Having achieved a Designation as established by IASSC™, one is entitled to use the IASSC™ Marks in conjunction with one’s name to demonstrate this accomplishment; provided, however, such usage is in compliance with the rules outlined in this Policy. 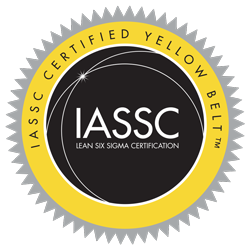 The rules contained herein are important to maintaining the value of the IASSC™ Marks. Therefore, IASSC™ will endeavor to be diligent in its supervision of the use of IASSC™ Marks and aggressive in its defense of any violations. Additionally, IASSC™ pledges to those who acquire a Designation through IASSC™ that IASSC™ will strive to be diligent in pursuing those who utilize the IASSC™ Marks without having properly attained a Designation status or have received explicit permission to do so. Please become familiar with this Policy and apply its rules and guidelines when developing collateral pieces that feature the IASSC™ Marks. In doing so, you will help IASSC™ to concentrate its efforts on the other important aspects of its business and to apply IASSC™ Mark protection efforts to those who may being conducting themselves in a manner detrimental to the value of the IASSC™ Marks. If you need further assistance or would like IASSC™ to review business materials you are developing that feature the IASSC™ Marks, feel free to contact us at service (at) iassc (dot) org. 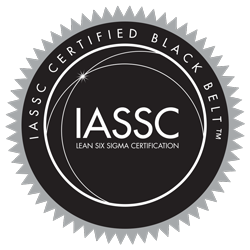 Thank you for your assistance in positioning the IASSC™ Marks as a recognized standard of excellence for practitioners of the Lean Six Sigma methodologies. 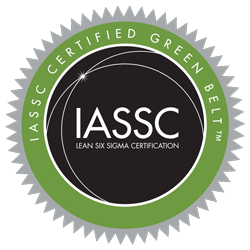 The trademarks, “IASSC™” and “International Association for Six Sigma Certification™” may not be used in any manner, other than described herein, without advanced written permission. These Marks are intended to be used with an accredited entity’s name in the following manner. These Marks are to be presented solely in the manner shown. The words that comprise these Marks are not to be used as parenthetical descriptors of the acronyms for the Marks, such as XYZ, Incorporated is an IATO (IASSC Accredited Training Organization™). No other arrangement or derivative words made be used other than those stated here. These Marks are intended to be used with a certified party’s name in the following manner. These Marks are to be presented solely in the manner shown. 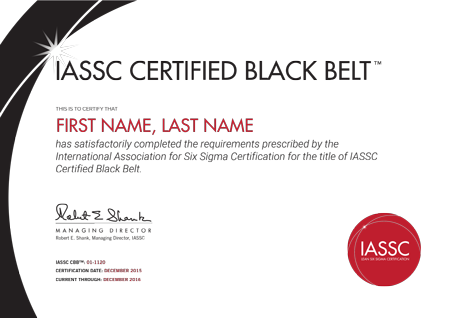 The words that comprise these Marks are not to be used as parenthetical descriptors of the acronyms for the Marks such as John Doe is an ICBB (IASSC Certified Black Belt). No other arrangement or derivative words made be used other than those stated here. These Marks are intended to be used with an authorized entity’s name in the following manner. These Marks are to be presented solely in the manner shown. The words that comprise these Marks are not to be used as parenthetical descriptors of the acronyms for the Marks, such as XYZ, Incorporated is an IAEA (IASSC Authorized Exam Administrator™). No other arrangement or derivative words made be used other than those stated here. Associated with the Accreditation and Certification Designations are Logos in the form of a Badges, Seals and Certificates (“Logos”). Upon an individual or entity’s achievement of a Designation, the appropriate Logo may be used on business cards, stationary, promotional material and websites. Logos must be used in the exact configuration and colorization as shown in Schedule A – Badges, Seals and Certificates. Since there are a number of potential uses of the Logos, IASSC cannot specifically define each appropriate use. IASSC™ asks that you grasp the intent of the IASSC™ Marks Usage Policy and utilize the Designation Logos you have earned in a professional manner properly representing IASSC™ and yourself. IASSC™ reserves the right to deny any use of the Logos it determines to be inconsistent with the objectives of IASSC in its sole discretion. The following are the IASSC™ Logos, Badges, Seals and Certificates of IASSC™ and associated with the various accreditations and certifications of IASSC™ and may not be reproduced, copied or used in any manner other than described herein. To maintain quality control over the appearance of the IASSC™ Marks, IASSC™ requires all reproductions be made from original artwork, be readable, legible and on approved backgrounds and have consistent use of color. All reproductions of the Marks must be made from original reproduction artwork provided by IASSC™. Upon your meeting the requirements for a Designation, IASSC™ will provide you original artwork for the appropriate Logos. The impact and legibility of the printed Mark will be lessened by crowding it with other visual elements. Please allow an appropriate “clear zone” surrounding the Mark. The exception to this rule is when a Mark is used within text. The Marks should be used on light colored backgrounds ranging from white to values no darker than 40% of black. Should the background of your presentation be darker than the specification then a lighter color background should be used in the space allocated to the Mark. 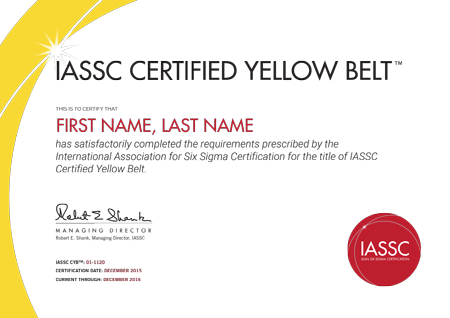 Consistent use of color in the Mark is important to establish immediate recognition of the IASSC™ Marks. Utilize ONLY those colors provided in the original artwork.